Reliance makes Milton homes more comfortable. In Milton and all around – from Beaty and Bronte Meadows to Fallingbrook, Forest Grove and Ford – you can rely on the Reliance team for friendly and knowledgeable call support as well as expert and full licensed technicians and installers. We're all here to help you find the right home comfort solution for your home. Call us anytime, 24 hours a day, and we'll answer your questions or concerns about your heating, cooling, plumbing and more. As for our on-site experts, they're fully licensed and get continuous training so you can be sure the products we install and services we perform are top notch. Please also ask us about our industry-leading guarantees and protection plans – they're a smart way to make sure you're always being looked after. At Reliance, our aim is simple – to be Milton's first choice in heating, cooling, plumbing and air quality. Contact us anytime and our capable team will look after you. Hi, I'm Mike, your Home Comfort Advisor at Reliance Home Comfort in Oakville. It's a great place to work – both because of the team and teamwork we're exposed to every day and because I get to help people in my neighbourhood stay comfortable with the amazing products and services that Reliance provides. When I'm not working, I love to spend time on my hobbies – including classic cars, sailing and canoeing. Need help with your heating and cooling? I'm around so don't hesitate to ask. Hi, I'm Sarah. As a single mom with a 5-year-old son, I feel lucky to work at place like Reliance Oakville. 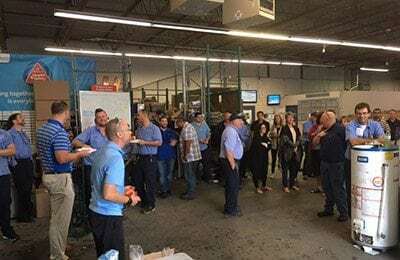 It's such a positive team atmosphere with a great work/life balance, where everyone takes care of each other and our customers. When I'm off work, I enjoy taking my son to hockey or out and about on the trail runs. Whatever help you need for your home, from air conditioning or a new furnace, plumbing or air quality solutions, Reliance is the place to go. Please give us a call! Hello there. My name is Rick and I'm a Reliance Home Comfort Advisor in Oakville. I love working here because everyone on my team really cares about our customers and helping find solutions that can save them energy and make them more comfortable in their homes. It's a pretty simple philosophy – treat our customers the same way we want to be treated – and it feels great. In my spare time, I love to travel, and I enjoy fishing and, in winter, the exhilaration of skiing. Whatever your home comfort needs happen to be, I'm certain I or someone on our team can help – so give us a call! My name is Tony and I'm a Home Comfort Advisor in Oakville. I really enjoy working at Reliance. Why? Because, like me, they really care about taking care of customers and making sure you're happy from first contact to long after the installation is complete. It feels good to provide the right solution – every customer is different and I really like meeting and interacting with each one to find out who they are and what they need. In my spare time, I love spending it with my two young children as well as playing tennis at the Bronte Tennis Club. Don't hesitate to reach out if there's any way I can help you with your home comfort needs. How are you? My name is Joel and I'm a Home Comfort Advisor at Reliance in Oakville. I'd say the best part of my job is talking with people, building a relationship and customizing home comfort solutions based on what each homeowner wants and needs. When the day is over or the weekend rolls around I stay active with sports – and really like hiking. Whether you need a new air conditioner or furnace, or you need a tune up – or even if you just have a question, call Reliance. Everyone on our team is always ready to help! Hi, I'm Tyler, your Home Comfort Advisor in the Halton Region. As someone who's been the heating and cooling business for two years now, my goal is simple: to make sure you get the best home comfort solutions to meet your home's needs and your family's budget – and I'll always work hard to make sure that happens. When I'm not helping my Halton-area customers, my wife and kids love to go to Easterbrooks and for walks at Hutches. I also really enjoy golf, hockey, baseball and staying fit. Whatever you need to keep your home comfortable, I'm here for you – so please contact me anytime. The town of Milton and the surrounding area are such an amazing place to live, work and play. That’s why, even when we’re not taking care of your home comfort, we still lend a hand to make Milton better, particularly for those less fortunate than us. We are enthusiastic supporters of United Way and Habitat for Humanity and take part in several fundraising activities throughout the year. We also love to do what we can to ensure children in the community stay active, so if you have a sports team that needs a sponsor, ask us! 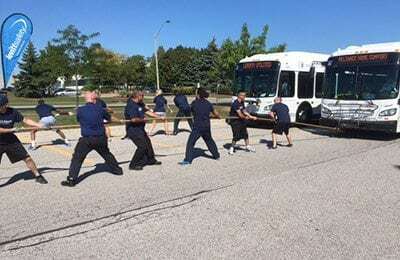 Our team members took on 9 other teams pulling a full-size city bus to near victory (third place – or rose gold as we like to think of it) at the Oakville United Way Bus Pull! Each year, we hold a barbecue in support of United Way where we ask our team to donate via payroll deductions, matching every dollar they donate – doubling the impact. One in three local families in benefit from the agencies supported by United Way and we’re proud to do our part. 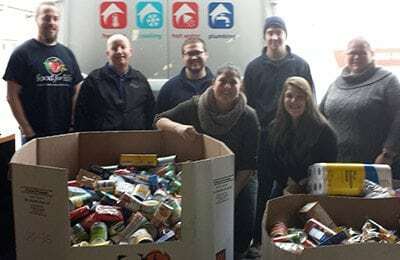 During the holidays, we partnered with local community organizations including United Way and Food for Life to help make the season a little brighter for those in need, contributing a truck-load of non-perishable food donations. "After a full day of intensive work by 3 professionals from Reliance, we have a whole new home comfort system: furnace, wireless thermostat, air filter, hot water tank, humidifier and air conditioner. It’s the end of March and still cold outside, but in our new home it’s quite warm and comfortable. They promised that we would have a totally different experience of home comfort with the new installation, they delivered! Most importantly - there’s a seasonal promotional discount from Reliance and rebate from Energy. Thanks Richard for the professional advice to a new comer family in Oakville. Appreciated." "From my first phone call 4 days ago when I realized my furnace was not working. I called the service center to be greeted by a very helpful lady. Time was 3:50 pm, there was a serviceman at my door at 5:10 that same evening. He deemed the 13 year old furnace to be unsafe as the heat exchanger had a crack in it. An advisor was here the next afternoon, cutting into his weekend time with his family. Extremely polite,knowledgeable about the product and giving me options about what I could do. At 8:00 am Monday morning, two installers arrived with a new furnace, a/c and humidifier. By 1:30 , the heat was back on, all programs were explained and manuals left for me to read over just to confirm the instructions. Thank you to the team at Reliance!" "The technicians that came to my house were very courteous and polite. Informed me of each step by step process and worked within the time frame that was estimated. They were very knowledgeable and explained exactly how the unit worked, made it very easy to understand. Afterwards, they made sure to clean the work area and took any garbage from the site. I am happy with this service and happy to have a new working furnace." "Jocelyn was fantastic. We would recommend her for any plumbing issues. Our problem started when our hot water mixing valve failed. The valve was replaced and the incoming city water valve was fully opened but pressure was causing knocking in our pipes every time we ran the washing machine. Jocelyn did some amazing troubleshooting and stuck with us to resolve all the issues. We had multiple visits until the issue was completely resolved. We have hot water and the knocking is gone! We will always request Jocelyn for our future plumbing work, and we will be keeping the protection plan. Thanks Jocelyn!"